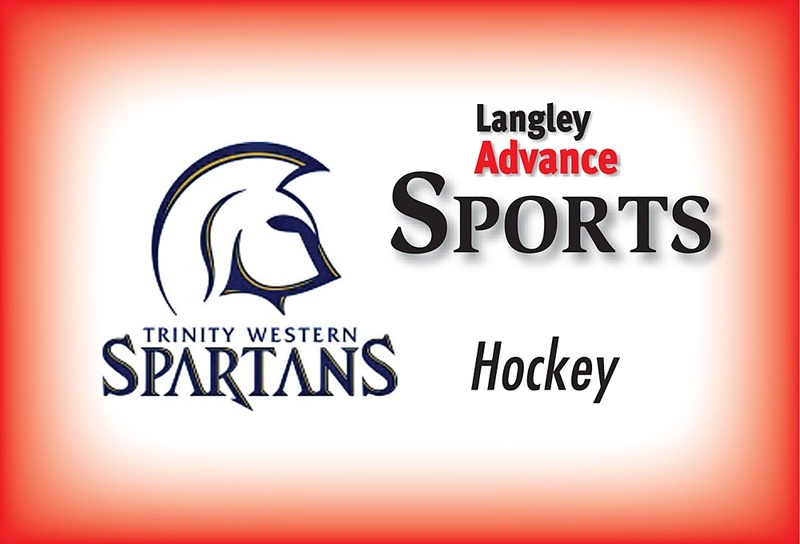 Dec. 3, 2014 10:00 p.m.
Trinity Western Universityâ€™s hockey team will play its final game of the semester on Friday, when it hosts Eastern Washington at 7 p.m. at the Langley Events Centre. Sitting atop the B.C. Intercollegiate Hockey League standings with an 8-2-0-2 record, the Spartans have a chance to widen their first place lead, and with a win would enter Christmas break five points clear of Selkirk and Victoria, and potentially six points ahead of Simon Fraser. The last time TWU faced EWU, which has a 4-8 record, the Spartans came away with a weekend sweep on the road, winning 5-2 on Nov. 21 and 3-1 on Nov. 22. The Spartans are coming off a bittersweet loss to Simon Fraser University last Saturday in which they rallied from a two-goal third period deficit to force overtime but then lost in a shootout. With eight wins to their credit this season, the Spartans have already put together far and away their best opening semester in program history. A win Friday would put a tidy bow on an impressive first half and solidify the Spartans grasp on top spot heading into the break. The Spartans are at the halfway point in the season and they have yet to lose back-to-back BCIHL games. Following each of their three previous losses, the Spartans have bounced right back to earn a win in their next regular season contest. Coincidently, each time TWU has lost this season, the Spartans have come back with a victory over Selkirk. This time, EWU will be the opposition, but the Spartans are hoping the trend continues and that their most recent loss doesnâ€™t turn into a streak. Prior to the Spartans loss to Simon Fraser in which they allowed four goals in regulation, TWU had allowed just three goals in its previous three games. The Spartans had shutout Selkirk 4-0 before earning 3-1 and 5-2 wins over EWU. Against the Eagles, TWU was as strong defensively as it has been all year and largely held the Eagles offence in check. In his first year with TWU, PJ Buys has quickly become an offensive force for the Spartans. Through 11 games, he is second on the team in points with five goals and 11 assists. In TWUâ€™s last game, Buys had his most impressive offensive output to date as he was in on all four Spartans goals, collecting one goal and three assists. Heâ€™s also earned at least a point in nine of the 11 games heâ€™s played.